After Yarndale, my head was full of all things wooly, and what better way to commemorate the first festival than with my own tribute - Sheldon the Sheep! This is my very first attempt at designing my own amigurumi, so please let me know if you spot any mistakes, or if anything is unclear. I would love to hear what you think of Sheldon - good or bad - so please leave me a comment at the bottom of the page. He's adorable! I can't wait to make one. Thanks for sharing your creativity with us. He's adorable and you have such talent! can Sheldon be made into a puppet? Just found your blog--headed over from Ravelry! I simply love this little guy! He has so much personality! Happy to have found you! Thanks for sharing! Absolutely FAB....I would love to give this a go, I find written patterns very tough, but i would be prepared to suffer Brain-ache for this one! He looks great, but for those of us who are relatively new to crochet can you please explain what loop stitch is. Thank you...then I can create my very own Sheldon!! Thank you, I was just about to hit Google to look for directions. Still learning to crochet so the loop stitch is a new one for me. Sheldon is beautiful, thanks for sharing this pattern. Fantastic! I will make him for me! Yes that's right... me! It will make a change! Karen I'm the complete opposite - if I ever try and knit it ends up in a big holey mess! Thanks a lot! I love love love Amigurumies!!!! He is adorable! I will be making him soon! Sheldon is THE CUTEST. And I love your blog - found him and it via the Yarndale facebook page. I'm a HUGE Lucy Attic fan too. Her tutorials are the best, I've recommended them to so many people. Her join-as-you-go method will totally convert you to granny squares if you get fed up with adorable animals any time soon (no!). Anyway, sorry, I'll stop waffling - I want to make a Sheldon at the weekend - did he use up the whole of the yarn you quote? Cos I'm hoping to make him from stash - if i can't he'll have to wait til next weekend :( Thank you so much for sharing him! Keep on hooking! 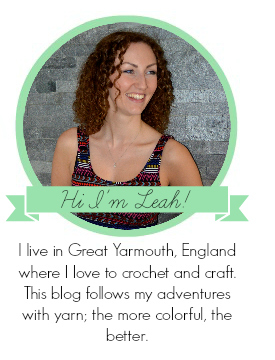 Hi Rasberet, I completely agree, it's Lucy's bright colours and easy tutorials that really got me into crochet and her ripple blanket pattern is brilliant! As much as I want to try something new, I always go back to the ripple when I make a blanket as a gift. I really try with granny squares, I think it's that I'm just too lazy to deal with all those ends! Good question about the yarn; to be honest, I was pretty generous in my yarn allowance as I crochet very tightly and so wanted to allow for people that have a bit more relaxed approach. He took me exactly one ball for the cream body (100g) but only a smidge of grey and black. Wat een prachtig schaap! Wat heb ik genoten van jouw prachtige blog! Hi Mary-Beth, I think the best way to determine which hook to use for amigurumi is to do the first few rounds and then hold the piece over the palm of your hand. If you can see through it to your skin, then you probably need to go down a hook size, if not, the stuffing will show through your toy at the end. Love him, could you explain what you mean by a magic ring please. The magic ring is a nice way to start when working in the round so that you don't end up with the hole at the top as you would if you started by chaining 2 and then crocheting 6 double crotchets in the second chain from the hook. just to clarify then....I am in the US so anytime you pattern says DC I should SC? Hello Leah, pleased to meet you. I'm a "crochet addicted". 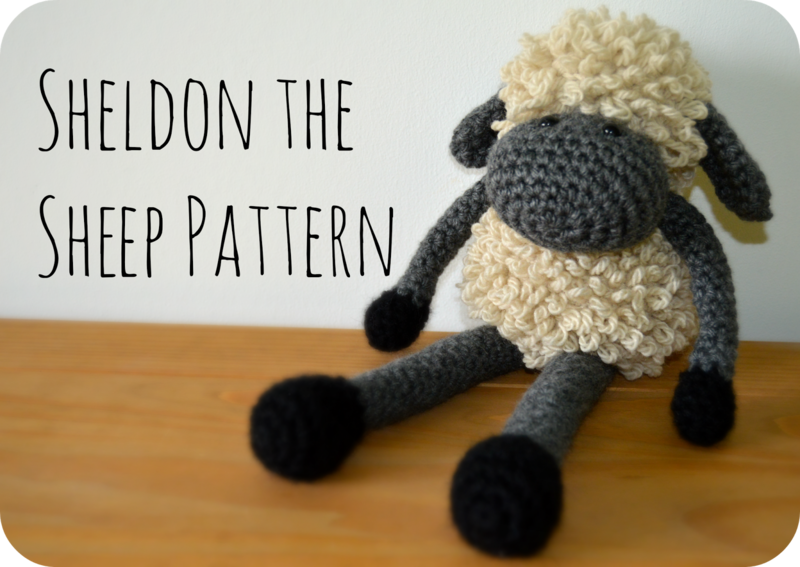 When I saw your sheep some days ago, I joined your blog and I tried to make my own Sheldon, but I'm really bad following patterns (I love to "invent"), so at the end I made it similar but with some differences (for example, I didn't use the loop stich). In some days I'll publish it in my blog (teixinteixint.blogspot.com). If you agree, I'll mention you make the pattern and I'll link it to your blog. Hello, Sheldon is adorable, this was my first crochet project and I found it hard, but in the end it came out kind of cute. I did the crochetting spiral, I don't know if that is the way you had to do it, but it kinda worked. So if you have any tips for me I wil be crochetting another one for my son. Thank you for sharing Sheldon with us. sorry I tried to post a picture of my version of Sheldon but it does not seem to work well. Thanks for the lovely pattern, it was a bit difficult with the loop stitch and I was mostly struggling on how to decrease in the loop stitch (in the end I found it works best if you only make the loop in the last stitch). Let me know if you'd like me to translate the pattern in Dutch? I did a double loop stitch for body, thanks for inspiring me to tackle a new craft. This is so cute! I would love to make it, I just need some help with the loop stitch. Could you please explain it?? He is so cute. I'm going to give him a try. Thank you. Love this little fellow, can't wait to get started. Thanks for sharing. Hi, I can't seem to figure out how to do he loop stitch decrease. :( can you help me out? Thanks a lot for your pattern. It tooks me time but I did it. Love it !! I'm working on Sheldon....his face seems way too large for his head and body....the head is the size of a tennis ball and the body the size of a softball....and his head is about the same as the body. I used the Redheart instructions for the double crochet for the face....I'm thinking I should redo with single crochet. Thanks for any help. Hi! I have the head and body done. (He's adorable!!) Since it's not noted, I have to ask--when doing the face/ears, do you work in both loops or just the back loop? Thanks! Absolutely love Sheldon! My mom made it and she gave me the link so i could make it myself.. I just learned to crochet 2 weeks ago so the body and head was a bit challenging at first, but those 2 parts are completed! Can't wait to see the final result. Love the pattern and am just about to start making my own Sheldon! I know how to do the loop stitch, but I don't understand how doing the 'loop stitch' on every round works. Surely that would produce a loop on the inside as well as the outside? I made Sheldon for my Dads 71st birthday, and he loved him! Going to make one for myself now. Thank you for a great pattern. I have two questions that perhaps others who have made this can answer. First, the magic ring. What does it mean by six? Do I cast on 3 then sc 6 times to make the ring? Also do you connect the body parts with a tapestry needle? Thank you. I did not read the other comments so please forgive me if this question has already been answered. What is the completed size of Sheldon the Sheep? I am looking for his length from head to toe. Thanks! Hello! Thank you for your pattern. Sheldon was a joy to make. However, I wanted to point out that for his hands. Rounds 3 & 6, there is an error. The instructions should be repeated 3 times instead of twice. Thanks again! Sheldon is adorable! Could you tell me what size safety eyes you used please? Really sweet sheep! Thanks for the pattern :)! With the magic ring it says 6, is this 6 dc or sc into the magic ring? I looooooove it!! My mum used this to make a mobile for her future grand daughter and its perfect :)Thanks!!! Here it is 2017 and your Sheldon is still making people smile. But, I have to tell you, I live in the good old USA.. and was so excited to make little Sheldon... I didn't read the SC vs. DC comment about the difference between them from countries. I pulled little Sheldon about a dozen times.. and stared at the picture... then I finally realized that DC is SC in the USA. LOL. I can laugh now... but, it wasn't funny when I was throwing a looped mop around the house!! I love this pattern! Thanks. Hi, I'm in the US too and was a little concerned about trying to "translate" the stitches. Is the SC vs. DC the only difference? Thanks!